…Detroit’s notorious devastation is not a natural disaster but a man-made Katrina, the inevitable result of illusions and contradictions in our insane 20th century pursuit of unlimited economic growth. [In a new documentary, Requiem for Detroit?] we witness autoworkers reduced to robots producing Henry Ford’s Model Ts—and then struggling to reclaim their humanity through sit-down strikes or battling Ford’s goons at the overpass. We meet Southern blacks who relish the “freedom” of Northern cities but also experience the racial tensions that exploded here in 1943 and 1967. Cars that grow the profits of the auto industry speed by on freeways which destroy neighborhoods to provide escape routes to the suburbs. Neighborhoods are turned into war zones as the drug trade replaces jobs that have been exported overseas. …The new American Dream emerging in Detroit is a deeply-rooted spiritual and practical response to the devastation and dehumanization created by the old dream. We yearn to live more simply so that all of us and the Earth can simply live. 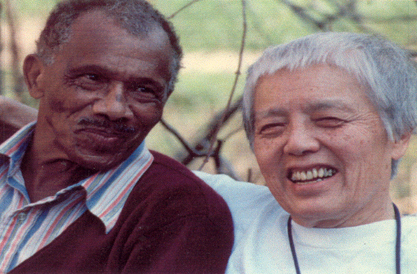 This more human dream began with African American elders, calling themselves the Gardening Angels. Detroit’s vacant lots, they decided, were not signs of urban blight but heaven-sent spaces to plant community gardens, both to grow our own food and to give urban youth the sense of process, self-reliance, and evolution that everyone needs to be human. That’s why growing numbers of artists and young people are coming to Detroit. They want to be part of building a City of Hope that grows our souls rather than our cars. Yesterday at the first full day of the Forum, I attended a morning workshop whose leader had written me in the spring with a specific invitation to join a conversation about arts and activism. At that earlier point they were contemplating using the panel format but yesterday’s workshop was entirely and blessedly different: very interactive. We first walked slowly and then hurriedly in the group tightly packed, loosening up, avoiding bumping while making some contact. Then stop and reach out to someone nearby, touch their shoulder, say who you are and what you are bringing, doing, hoping, etc. Then in a circle one person begins a game by saying, all my people who are photographers doing social justice work, or the like, prompts all who are doing this to scoot across the circle to exchange places. We stood shoulder to shoulder. One is left out who then announced, all my people who are making murals. Etc. Small groups, large group, and other devices brought us together as artists or near artists working for transformation of systems. In my small group I met 3 young black people working in their Chicago high school to foster deeper food awareness. Beginning on Earth Day and lasting an entire week, they focused on food—buying and eating healthfully, and tending the earth. The themes of the small groups were stories of success, lessons learned, and challenges faced. Our group spoke about breaking the quotidian trap, finding a wider audience, generating media attention, making the work more collaborative, and using the values of a group we’d like to penetrate, like the Tea Partyers, and then subverting or transforming those values, as one in our group did about single payer health coverage. Rather than attend the first of 2 afternoon workshop sessions I wandered around the huge hall housing table displays. Each stop I made of about 6 was a mini workshop, tailored precisely to my needs, one on one, and highly engaging. I met a representative of Friends of the Earth US, the Palestine center from Chicago where I remet Jeff from the International Solidarity Movement who I’d first met in Palestine 3 years ago, an online Palestine store, an anti-racist org, a group fostering awareness of democracy in college age people, the Christian Peacemaker Teams, and the American Friends Service Committee where I learned about a program on later that week that they sponsor about Palestine, and many others. I’ve not found yet a space to hang my Gaza photos. Checking the tent area early morning with Rick, Grove, and meeting Dave Matos, my tour organizer, we all were disturbed by the tent’s distance from the main events, and that they had no walls. There is an emigration from this area, nearly 1 mile away, which is not a scenic walk, to Cobo Hall where most events will be held. The final workshop, attended with Ridgeley from Waltham, a gutsy feisty woman on the Israel-Palestine topic, was about journalism in Israel-Palestine with representatives from the Electronic Intifada. Departing from the popular education model favored at the Forum, 2 young women, one a writer, one an editor, spoke mostly about the work of Electronic Intifada, and principles of good journalism. They began by having us brainstorm topics for stories, I suggested comparing Wounded Knee and the Nakba. I thought then we might work one thru but instead we examined selected stories Electronic Intifada had published. Not bad, but most of the material I knew and felt confident many others did as well. Yet, the 2 hours were useful. 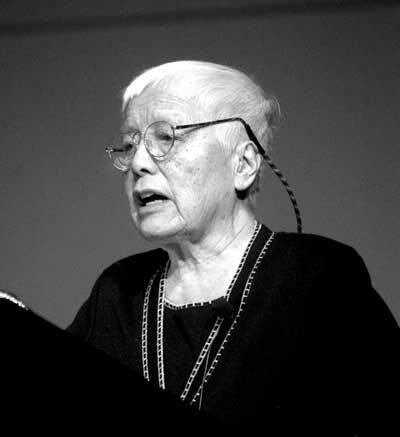 We took the evening off; I missed the 95th birthday party for the preeminent Detroit based political organizer, Grace Lee Boggs. Y is tuned to the Forum thru Democracy Now, wrote me to not miss the Boggs’ party. It started at 9 PM, Rick and I wished to be home to rest and plan our workshops for today. I also wanted to do my laundry. On the way home we shopped for food in our neighborhood, more than an ordinary event. 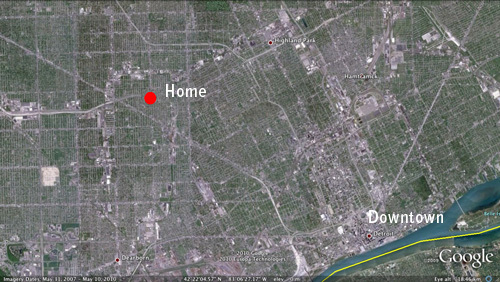 To locate a major food source is a chore here; we’ve seen nothing in all our driving around Detroit. We heard about one, some 1-mile north of home on Wyoming St. It is adequate. We are now well stocked with food, including some of my necessities like peanut butter, yogurt (no large containers, only the small heavily sweetened portions), bananas, cottage cheese, cheese, bread, etc. I worked on my Hydropolitics of Palestine/Israel workshop plan last evening, tuning it to the Forum workshop context. Awakening around 2 am, I had a rough time falling back to sleep. Once again, the Hour of the Wolf syndrome kept me awake while flooding me with new ideas. Among them, mentioning to my upcoming Hydropolitics workshop Detroit’s founding along the strait between 2 major rivers, the name Detroit itself expressing this idea in French—along the strait. Another storm hit us last night, with wind, lightning, and thunder, plus driving rain. Much like the storm I suffered while busing back home last week. For this entertainment we’d assembled on the front porch, mostly out of the rain, exclaiming our joy at the fireworks. In the first of 2 dreams last night I was tending a little girl, whether Katy, my daughter, or Eleanor, her daughter, is not clear. We’d been at some sort of gathering, talked as adults together, ate lunch provided by others, and then headed off on a walk. We came to a median strip, took a break, when I noticed P, Katy’s mother, moving toward us. Guess who’s coming to meet us? I said, with much excitement. 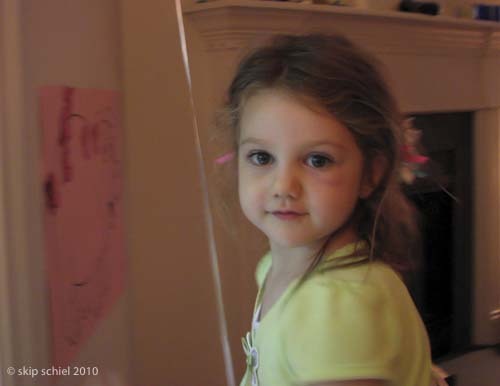 Eleanor turned her head, saw grandma, began running toward her when Eleanor fell down and furiously vomited. P and I were alarmed. The dream ended. In the second I was with a woman with whom I’d established cordial relations. She did not resemble any of the women I know. She was pleasant, moderately attractive, without much frisson but possessed enough to generate my interest. We sat near each other at a table with others, found ourselves peering deeply into each other’s eyes as a signal of recognition that we had become a couple. We also rubbed knees together, another sign known only to us. The dream ended. Both dreams ended inconclusively, as the majority of my dreams do. These 2 dreams represent two points of my passions: grand parenting and adult love. Also the two themes mix—my relationship with a little girl as another type of love. I think your blog would be more useful and effective if you could split it into two blogs–one for the subject matter you are headlining (in this case Detroit and the USSF) and the other for your dream life. 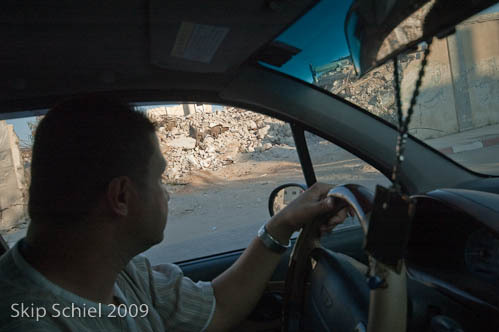 During the first half of this post, I was thinking “how brilliant” to describe the workshop and juxtapose with the Gaza rubble (which I at first took to be Detroit rubble). I wanted to sent the link to many friends who couldn’t get to Detroit–or Gaza. But the coda of the dreams did not seem integral to the messages of the post and things seemed to deteriorate from the visionary into the confusing and personal. I didn’t want to pass this part on to my friends. i think you’re right. i might do as you suggest, thanks so much once again dear friend for your insights. if the dreams informed the main text, or vice versa, they might be more integral. but they’re not so we’ll see.